Chu, Mineta and other community leaders show their support. SAN GABRIEL — Former Secretary of State Hillary Clinton brought her Democratic presidential campaign to the Southland on Thursday, helping introduce the “Asian Americans and Pacific Islanders for Hillary” initiative and attending fundraisers. Rep. Judy Chu (D-Monterey Park) and dozens of Asian American and Pacific Islander elected officials and community leaders from across the nation joined Clinton to introduce the campaign initiative at the Hilton Hotel in San Gabriel, with the presidential hopeful insisting she will fight for them as president. Chu said Clinton understands the priorities of the community: “Asian Americans and Pacific Islanders are the fastest-growing racial demographic in the country, yet have too often been denied a seat at the table. In my conversations with members of the community, there is a real thirst to be involved and heard, which is why it is essential that candidates see that AAPIs, once marginalized, are now becoming the margin of victory. Clinton also attended a luncheon fundraiser hosted by Chu, the chairwoman of the Congressional Asian Pacific American Caucus, where about 250 attendees contributed $2,700 to attend, according to the Clinton campaign. Clinton acknowledged the presence of elected officials like Rep. Gregorio Kilili Camacho Sablan of the Northern Mariana Islands, State Treasurer John Chiang, Fiona Ma of the State Board of Equalization, and San Gabriel Mayor Jason Pu, as well as Irene Bueno, AAPI director for Clinton’s 2008 presidential campaign; Trung Ta, founding chairman of the Vietnamese American Democratic Club; and Dennis Cheng, Clinton’s current finance director. Also present were State Controller Betty Yee, West Covina Mayor James Toma, Los Angeles City Councilmember David Ryu, actress Ming-na Wen, and Olympic medalist Michelle Kwan, among others. “I was so proud to work with the AAPI community when I was a senator from New York,” Clinton said. “America’s ties to the Asia-Pacific region have always bee important, but in the 21st century they will be absolutely vital. I was very proud when my husband’s administration launched the first-ever White House Initiative on Asian Americans and Pacific Islanders. “And I know there are some people here – they were young people then – who actually worked in the White House, worked in the Clinton Administration, helped to put that initiative into place. The focus was for the federal government to be more deliberate about understanding the challenges helping all parts of the AAPI community succeed. “And when I was secretary of state for President Obama, and we launched the ‘pivot to Asia,’ we were sending a very strong message that we wanted to rebuild ties with our allies and reassert the United States as a Pacific power. So we have the groundwork here at home and around the world laid, but it’s going to take a president working as your partner, standing with you, fighting for you every single day to make the kind of progress that we can make together. “Now, I think of this story through the lives of so many people whom I have gotten to know over a lot of decades. One of them is Norm Mineta, who is with us today. Now, some of you know Norm as a dedicated public servant, an elected official, a Cabinet secretary, both a Democratic and Republican administration (secretary of commerce under President Bill Clinton and secretary of transportation under President George W. Bush). But he also reminds us of an important lesson about our nation, and what it takes to make it work for everyone. “You see, when Norm was a child during World War II, he and his family were forcibly removed from their home and put into an internment camp. He was ten years old. And he was a huge baseball fan. And as he stood with his parents, waiting for the train to take them away, a military police officer confiscated his possessions, including his most prized possession, his favorite baseball bat. That wasn’t in some far-away country. That was here, in the United States. “Yet despite his own personal experience, Norm never stopped believing in the promise of America. And that’s one of the reasons he was motivated to serve our country, to represent his neighbors and to make a real difference on everything from infrastructure to protecting our oceans. “I tell you this story and I think if we had time, we could hear dozens and dozens of stories. Personal stories about the journeys that brought you, your parents, your grandparents here to America. But I want to make a larger point. I disagree with the Republican front-runner, Mr. Trump. See, I think America is great because generations of hard-working Americans have made us great. Our values and our ideals have made us great. Now it is up to us to make sure we are even greater when we pass on the opportunities that have been made available to all of us to our children and our grandchildren. Clinton further addressed recent comments by Donald Trump and other Republicans. “We are hearing a lot of hateful rhetoric out on the campaign trail. Calling immigrants ‘drug dealers’ and ‘rapists,’ using offensive terms to describe the citizen children of immigrants, saying we should bar all Muslims from entering our country. Republican candidates have said they would turn away widows and orphans and apply a religious test to people seeking asylum as refugees. Small business — “I want to be the small business president. I want to make it easier to start small businesses, grow small businesses, get credit for your small businesses. And I especially want to reduce barriers to women and minority-owned small businesses. “I know how hard people are working, so let’s make it easier to balance work and family. That’s especially true for parents of young children. We’ve got to join the rest of the world by guaranteeing paid family leave. But it’s also true for people who are taking care of their aging parents, isn’t it? As a nation, we are not valuing and supporting family caregivers the way we should. Immigration — “We know our immigration system is broken. Millions of undocumented people are working and raising their families here, living in fear of seeing their families ripped apart. There are millions of family members of lawful permanent residents and U.S. citizens who wait for years, sometimes for decades, to have their families join them in America. We can do better than this. “We could add hundreds of billions of dollars to our GDP by passing comprehensive immigration reform. We could shore up Social Security because right now, undocumented workers contribute $12 billion a year and if we have comprehensive immigration reform, it’s projected to go up to $20 billion. “Now ultimately, this is more than an economic issue, it’s more than a political issue. This is a family issue. If we say that we value and support families, then we should act as though we do. That’s why I voted for comprehensive immigration legislation in the Senate. That’s why I will fight for comprehensive immigration reform with a path to full and equal citizenship. “That’s why you can count on me to defend President Obama’s executive actions on DACA (Deferred Action for Childhood Arrivals) and DAPA (Deferred Action for Parents of Americans and Lawful Permanent Residents). “And I would go even further. There are so many more undocumented people with deep ties in their communities who deserve the chance to stay. I will fight for them, too. “When I was a senator, I worked to reduce the backlog for family visas and reunite immigrant families. I will keep up that fight. Applicants from the Asia-Pacific region make up about 40 percent of the family visa backlog. Some from the Philippines have been waiting for a visa for 23 years. If you’re a U.S. citizen and your brother lives in India, it will take at least 12 years just to get him a visa. Getting out the vote — “We’re going to fight to protect your right to vote and make sure your voices are counted on Election Day. I would like to see every 18-year-old automatically registered to vote. I’d like to see more early voting. And I would like to see the AAPI community get out and vote more. Clinton talked about one of the AAPIs working on her campaign. “Cheska is a DREAMer. She came here from the Philippines with her family when she was a young girl. Her father had a work visa, but he lost his job in the recession — and that meant the whole family became undocumented. “When Cheska was a senior in high school, teachers were asking her every day, ‘What are your college plans?’ She was in ROTC. She found the courage to tell her ROTC instructor about her situation. And her school stepped up. They supported her. They helped her investigate DACA and apply for relief. And she got it. And now she’s helping her four siblings with their applications. “The day after I announced I was running for president, Cheska signed up to volunteer with this campaign. Now she’s a field organizer in Las Vegas. She’s putting her college education on hold because she wants to help shape the future of the country that has given her so many opportunities. A GOP official was dismissive of Clinton’s AAPI initiative. 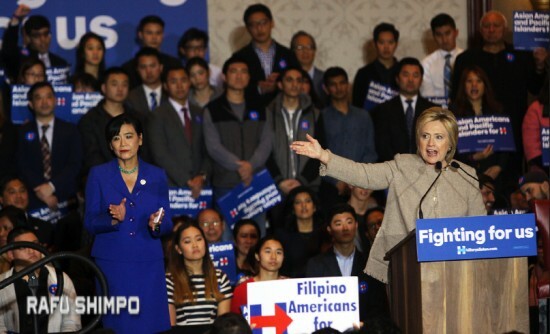 “While the RNC has for years been focused on engaging our nation’s growing AAPI communities, Hillary Clinton’s recent AAPI interests are for her own political fundraising benefit,” said Ninio Fetalvo, the Republican National Committee’s Asian Pacific American press secretary.